Once upon a time there were two students who were studying for their exams. One was a bright and cheeful person, always happy; and the other student took life very seriously indeed and often became depressed. One day while they were studying the happy young student felt thirsty and asked the tutor if it was possible to have a drink of water out of the glass on thr tutor's desk. "Of course," said the tutor, "help yourself." "I wont drink too much," said the student, "for the glass is only half full." A little later the second student, who was finding all this studying rather hard to manage, also felt a little thirsty and asked the tutor for a drink too. The tutor agreed and the student, who did not want to be too greedy said, "I won't drink too much, for the glass is almost half empty." If you saw a glass of water that was filled only half way up, would you say that it was half full, or half empty/ It really is a debateable point but it does show up the way people see things that are the same in different ways. People see problems in different ways too. What may be a problem for one person might not be a problem for another person. Some people can not cope too well with problems and sometimes need help to try and sort things out; whilst others might just brush away any problems with a laugh, and carry on living as if the day had no end. Some people look to the future with stars in their eyes; whilst others always look downwards and see mud clouding the horizon. Very often an outgoing person needs help because they often get cariied away with lots of grand ideas and then find that none of them are any good. In the same way, quiet and reserved people might need help because they keep things to themselves. Sometime, somewhere, some place, now, or in the future, we will all need someone's help. Some might be too proud to ask, others might be too embarrassed to ask, but ask we must, life is too short to bottle things up and keep them to ourselves. Even Jesus had to ask for help during one difficult moment in his life. He was praying to his Father for help and guidance when most of his friends had turned away from him. Even his followers had fallen asleep nearby and he had no-one to turn to. Never be afraid to ask for help if you have a problem, when you know that you need help, guidance and support. Don't look down at the footsteps in the mud to see if God is carrying you, look up to the stars and find that someone whom you can talk to, for God is always working through those people who will only be too glad to listen to you and help you when you need it. 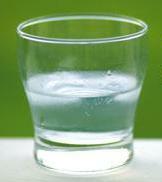 Then maybe when you look at a half-filled glass of water, it will be just that, neither half full nor half empty!!!! Original Author Unknown. Adaptation: © 1998 David West.